If your business relies on insights from reviews, comments or other aggregated data, chances are that you are tempted to engage in a little (or a lot of) web scraping. 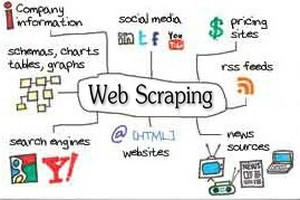 Web scraping is essentially conducting automatic data extraction from one website, for use by a different party. It’s sometimes referred to as “web harvesting” or “web data extraction”. The scraped information offers a snapshot of who and what users like, dislike, where there is a dense user population and where users are scarce, among many other types of data points. COPYRIGHT: aside from the “fair use” standards as it relates to the use of scraped data, there are issues of more traditional notions of copyright that exist in photos, videos and other visual data. TRADEMARK: logos, brand names, company names, taglines, certain sounds – these can all be subject to trademark protection, so you should take care to display those properly, without alteration or infringement. Web scraping of publicly available personal information is still open to interpretation and should be avoided if possible. A content creator’s content/data/information is often copyright protected. While facts cannot be protected by copyright, and this is a well-established tenet of copyright law, scraping opens the scraper to copyright infringement because facts arranged in a particular manner are copyrightable, and protected information. Scrapers may want to manipulate any scraped information as much as possible, to avoid copyright infringement claims. In copyright law, “fair use” permits third parties to use copyright protected works in limited ways. The more analytics performed on the scraped data, the more the scraped material tends towards fair use. The more “excerpting” performed on scraped data (i.e. not really changing anything, but just using snippets of data as is) the more likely you are to open yourself up to copyright infringement. Creating your own classifications and fields of information will generally mean playing around with scraped data, and organizing it in a different way than what you received from a robot will push your use of information towards the “transformative“, allowing you to create a stronger claim of “fair use” of information under copyright law. Scraping data, even when allowed, should not burden the originating site’s functionality. Use information provided freely through the API of each platform you’re trying to get data from. Using information from the API does not fall under “scraping” prohibitions outlined in the platforms’ terms, with various limitations and restrictions. Instead, you are free to use the information provided through the APIs of each platform in a manner consistent with any terms attached to the API itself.